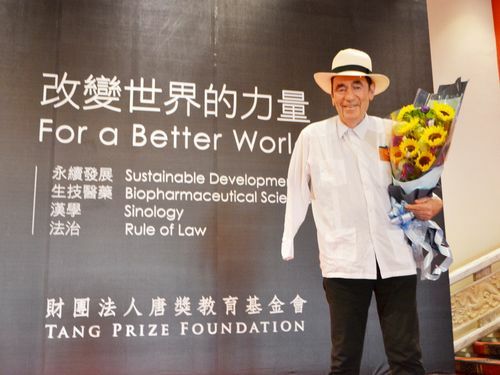 Albie Sachs, winner of the Tang Prize for rule of law. Taipei, Sept. 15 (CNA) The first winners of the biennial Tang Prize have arrived in Taiwan to attend the award ceremony and take part in a week-long series of lectures and other activities to celebrate the international academic award established by Taiwanese entrepreneur Samuel Yin in 2012. The five Tang Prize laureates are Gro Harlem Brundtland, former prime minister of Norway, winner for sustainable development; James P. Allison of the United States and Tasuku Honjo of Japan, who share the prize for biopharmaceutical science; Chinese American historian Yu Ying-shih, who won the prize for sinology; and Albie Sachs, a former justice of the Constitutional Court of South Africa, who was named the winner of the prize for rule of law. Tang Prize Week, Sept. 15-21, will kick off with a reception, followed by a concert by the Taiwan Philharmonic the following day, the award ceremony and a banquet Sept. 18, and two exhibitions that opened earlier this month and will run until Sept. 28. The laureates will speak about their life's work Sept. 19 at the Taipei International Convention Center, followed by a series of press conferences, and they are also scheduled to participate in forums around Taiwan, according to the Tang Prize Foundation.